Winthrop junior maintains the robotics team's first aid kit, created a safety manual, and maintains the team's Material Safety Data Sheets. Winthrop High School Rambler Robotics competed at the Pine Tree event March 31 and April 1 in Lewiston. 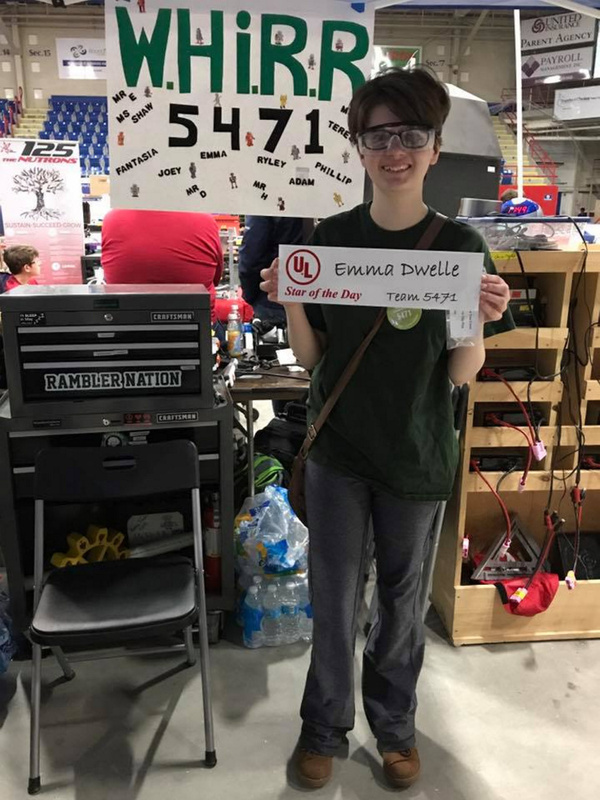 Team Safety Captain Emma Dwelle, 17, was awarded the Star of the Day on April 1 for her dedication to safety. Dwelle, a junior, maintains the team’s first aid kit, created the team safety manual, and maintains the team’s Material Safety Data Sheets. Dwelle’s outreach included talking with the safety captains who represented the other 39 teams attending the competition and providing a small safety kit for each team. She also spoke with other team mentors about how they can improve their team’s safety culture. The team’s robot, Amelia’s Return, competed well, including “climbing aboard the airship” in several matches. Controlling the robot was the drive team of Joey Tierney (drive coach), Fantasia Perez (driver), Phillip Easterbrooks (pilot), and Ryley Lassor (human player) and Adam King (human player). The team sponsors were Robotics Institute of Maine, Maine National Guard and Winthrop public schools. For more information about the team, visit www.team5471.org.